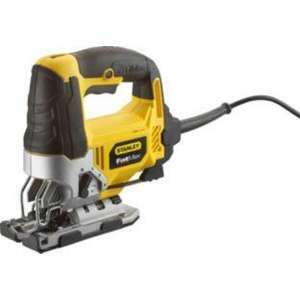 Stanley FatMax 710w Pendulum Jigsaw gives a fast and effortless cuts in wood, metal and plastics. With its safety features makes the tool safe and easy to use. •Variable speed min 800-3200 max rpm. •Cutting capacity for wood 85mm, steel 10mm, aluminium 20mm. •Additional features: Excellent cut line visibility. •Tool free blade clamp that accepts both U and T Shank blades. •Tool free indexed & adjustable shoe. •Pendulum action for improved cutting efficiency. • 1 x wood cutting blades. I was told it has dewalt parts in it.